Uric Acid Levels: Safe or Dangerous? In the Uric Acid Levels section, I explain the numbers you need to know about your blood test results. Because understanding uric acid is key to managing gout. Yet most people, including most doctors, do not understand uric acid levels. So learn these facts then you can take control of your gout. When uric acid levels rise too high, crystals form and you get gout. So uric acid levels form a vital part in gout diagnosis. Eventually, you get treatment and uric acid levels form a vital part of monitoring that treatment and making it successful. So to understand and control gout you have to track your blood test results and keep uric acid levels safe. When uric acid levels are above 6mg/dL you are at risk of gout. Then as your uric acid levels move higher, your risk of gout, and it’s severity, both increase. 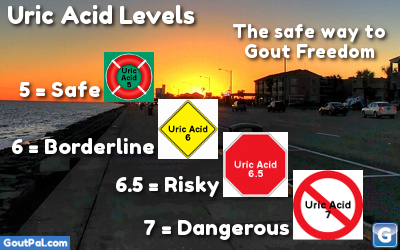 When uric acid levels are below 5mg/dL you are free from the risk of gout getting worse. However, you will need time to recover. But as your uric acid levels move lower, complete gout recovery gets nearer. Unfortunately, this simple situation gets complicated in the real world. 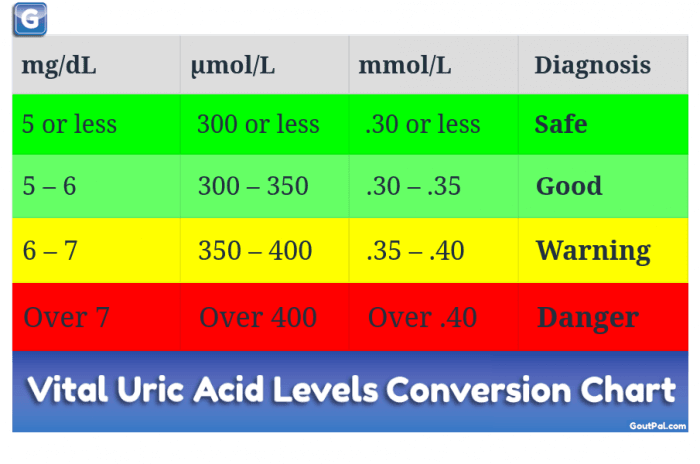 So I have developed charts, tables, and other explanations to help you understand uric acid levels. Uric acid level charts make it easy to see important gout numbers. Because you need to understand urate numbers to diagnose and treat gouty arthritis properly. See why low, high, normal ranges are meaningless. Get the best uric acid level chart to really help you control gout now. Uric acid level ranges are the most important part of gout diagnosis and treatment. Yet everyone gets them wrong. Stop looking at meaningless high, low, or normal levels. You need to know dangerous and safe urate levels. Get the medical uric acid range list now. For the science behind uric acid levels, see Understanding Uric Acid Resources. How safe is your uric acid number? You should now decide if you want some practical help with your uric acid levels, or if you want more uric acid facts. I can help you understand your uric acid levels, and how to manage your personal uric acid targets. For personal help with your uric acid levels, please ask in the gout forum. If you want more facts about uric acid levels, please browse other pages in the Uric Acid Guidelines. Leave Uric Acid Levels to browse the Uric Acid guidelines.